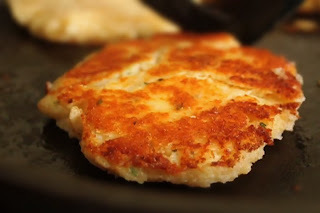 I loved seeing mashed potatoes at the dinner table growing up, not only because I loved mashed potatoes, but also because it meant my mother would be using the leftovers to make fried mashed potato pancakes. These were nothing more than cold mashed potatoes, shaped into patties, and browned in butter. I loved them, and use that same trick to this day. The potato pancakes you see here were born from another kind of leftover potatoes…the end of a box of instant potato buds. I'd used them while testing the crispy onion rings recipe, but didn't want to keep such an unsightly container in my pantry (you never know when some other celebrity food blogger is going to drop in to borrow a cup of foie gras), I decided to see what would happen if I used it, uncooked, in a potato pancake mixture. What happened were four crispy, buttery, perfectly decent potato pancakes! One advantage this version has over the freshly mashed one is those contain milk and butter, which makes it much harder to hold together when fried. I'm not saying you should just switch to instant, but I felt like I had to find some shred of a culinary advantage. Logistically, this would be perfect for backcountry camping, or your friendly neighborhood college dormitory for obvious reasons, not the least of which is its cheapness and shelf stability (and by "shelf," I mean an old milk crate, turned on its side). So, if you have some instant potatoes in the pantry, maybe consider giving this a try. Otherwise, remember this the next time you do find yourself in a similar situation. I mean, who would go out and buy a box just to specifically make a batch of these crispy, crusty, delicious patties? Enjoy!